Precious metals futures were mixed on Wednesday, the last trading day in May. Gold notched a decent gain, lifting prices to a 5-week high and into the black for the month. Silver, however, slipped from its own 5-week high. Gold for August delivery advanced $9.70, or 0.8%, to settle at $1,275.40 an ounce on the Comex division of the New York Mercantile Exchange. The settlement is the highest since April 24. Gold investors have been watching the "stock market rally, which has run so high for so long, and they’re eyeballing the Fed agenda, coupled with Trump news and the fact that we’re living in the midst of the seasonally-weak months of the year for the DJIA and S&P 500," MarketWatch quoted Adam Koos, president of Libertas Wealth Management Group. 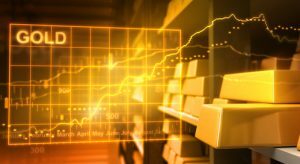 "For those reasons, it wouldn’t surprise me to see gold continue its intermediate-term uptrend since the beginning of 2017." Gold futures ranged from a low of $1,262 to a high of $1,276.80. They climbed 0.6% in May after gaining 1.4% in April. The yellow metal is 10.7% higher so far this year. Elsewhere, silver for July delivery shed 2.1 cents, or 0.1%, to close at $17.406 an ounce. Silver futures traded between $17.2 and $17.42. In the previous session, they settled at their best level since April 25. The precious metal logged a 0.8% monthly gain and is ahead by 8.9% for the year to date. July platinum tacked on $9.20, or 1%, to $950.30 an ounce, for a modest 0.2% monthly advance. Palladium for June delivery settled up $13.30, or 1.7%, to $815.95 an ounce, but declined in May by 1.3%. Both metals are higher so far this year with increases of 4.9% for platinum and 19.4% for palladium. Gold added $3.50, or 0.3%, to $1,266.20 an ounce. Silver gained 4 cents, or 0.2%, to $17.31 an ounce. Platinum rose $6, or 0.6%, to $947 an ounce. Palladium added $17, or 2.1%, to $814 an ounce. In May, platinum rose 0.1% while the other metal prices registered losses of 0.02% for gold, 0.6% for silver, and 1.2% for palladium. American Eagle gold coins tallied to 14,500 ounces after rising by only 6,000 ounces in April — their weakest month since December 2015 when the three most popular 2015 Gold Eagles had already sold out by November. The total marks a 141.7% increase from the previous month and a 81.1% decline from May 2016 when sales reached 76,500 ounces. Year to date sales at 186,500 ounces are 56.4% lower than the 427,500 ounces delivered during the first five months of last year. American Eagle silver coins reached 2,455,000 ounces, jumping 194% from the 835,000 ounces in April — their lowest sales month since December when the U.S. Mint had already sold the last of its 2016-dated supply by Dec. 6. However, the total is 45.4% lower than the 4,498,500 ounces moved in May of last year. 2017 Silver Eagle sales at 11,247,500 are down 52% from the 23,413,000 sold through the same time in 2016. American Buffalo gold coins climbed by 5,000 ounces, marking a gain of 42.9% from the 3,500 ounces sold in April but off 73% from the 18,500 ounces moved in May 2016. Year to date, sales at 64,000 ounces are 34.7% lower than the 98,000 ounces delivered during the January to May period of last year. America the Beautiful Five Ounce Silver Bullion Coins advanced by 40,000 ounces in May, down 56.8% from the previous month’s total of 92,500 ounces. Sales for the year so far at 231,000 ounces are 74.3% lower than the 900,000 ounces moved through the same five months in 2016.